This explanation for gravity is less common on this site, but is the dominant one elsewhere. At a basic level, where gravity posits an attraction between mass and mass, this states that not all directions are equal and that there is significance to the direction 'down' over any other. On a flat Earth, this would make more sense. The idea is that the driving force behind objects going down is their density rather then their mass. An object's motion is dictated by the density of their surroundings; if an object is denser, it descends. If it is less dense, it will go up. This is best demonstrated with reference to water. Less dense rock, like pumice, floats, while denser rock will sink immediately. However with salt water, where molecules of salt exist throughout the liquid and thus make it denser, more things will be able to float. Should an object be put in water with a sufficient amount of salt that their densities are equal, this theory states that the object will essentially be weightless. Given that everything is typically denser than the air, the medium that surrounds us, we are forced down to the Earth. Less dense gases meanwhile ascend. Assuming most people reading this thread are going to be using the links in the contents, I'm keeping these notes here. There are typos and small mistakes dotted throughout, and the format was made as I was going along so the layout is terrible. Read the actual AFET posts for a better overview. These notes are just here for personal reference. It begins... This post, and likely the following few, are going to be different to start with. I need to keep my notes somewhere, and this way at least there are interim notes. This is probably going to be the trickiest model to pare down to its essentials, as with the other posts I'm just going to be focused on the layout of the Earth and the observations this explains, not making arguments for or against. It'll be compressed to begin with, and a lot of the chronology focused posts omitted to focus purely on the Earth's shape. As I learn more about it, using this as a reference, hopefully I can arrange it into a better description. It's not meant to misrepresent, though I'm working from archived threads where not all the relevant links were archived, and going through a lot of terminology so mistakes are entirely possible. If I make any error, please do let me know. I imagine this is going to need a foreword when it's done. I'm cutting out a lot of material. If you're interested I do recommend Sandokhan's thread, he gives a lot of accounts of experiments and data that I'm omitting here in the interests of just giving an overview of how the Earth works. Equally, there are a lot of different terms for various entities which I'm cutting out. The Earth is a flat disc, centred on the Sea of Marmara. Antarctica is an island. Around the known Earth is a ring of land, populated by animals and plants, named as the continent Antichtone, and beyond this ring is a vast sea that was known of in ancient times and is the source of the Earth's water. The Earth is in the centre of the universe, is the sole planet, and is entirely stationary. There are two domes. The first comes down on the outside of this sea; on the outside of this First Dome is a rotational layer of ether, and in the dome there are six gates in the East, and six corresponding in the west. The stars, Sun and moon pass through these gates. Surrounding the first dome is a second dome; all of what we think of as the universe is contained within the second dome. The first dome is composed of a very dense layer of aether and ether. The Sun and all similar objects never pass inside the first dome. The Sun's orbit is composed of arches. It rises from beyond Japan, illuminates half the Earth's surface, and sets past Antarctica, where it then rises again the complete its orbit over the other semicircle of the Earth's surface. The Sun does indeed set. The circumference of the flat Earth is approximately a little under 40,000km. Now, on the aforementioned six gates theory, these mark the Sun's progress throughout the year. The Sun passes through each gate for approximately thirty days at a time (six in the east, six in the west), before moving on to the next, and the next; they compose the distances between the tropic. Each day it rises through one, and sets through an opposite on the far side of the Earth. The gates map out the period from summer to winter solstice, and from winter to summer solstice. There are thirty windows associated with each gate. Each gate is 1048km in arclength, and so each window is approximately 35.4km. The axial precession of the Sun is a gauge of what part of each window it travels through. When the Sun reaches the final part of a window, all celestial objects will be as they were originally. At this point it will be possible to see the moon as a separate entity during a solar eclipse. The moon receives its energy from the Sun. The Sun emits high frequency electric energy into the low pressure gas in the upper atmosphere causing the luminescence observed at sunrise. Thus a setting Sun swiftly becomes a rising one. Further, these electrical currents are the Birkeland currents associated with the Earth's magnetic field. They also affect comets, (insert more on electric comet theory here when it comes to writing up). There are Birkeland currents throughout space. The Sun, moon and all stars are flat disks. The Sun, moon and (for reference of scale) Jupiter have a diameter of 618m. The Sun is 10km up. The moon, Mercury and Venus rotate around the Sun, though Venus formerly orbited Jupiter. Meanwhile the Sun, as well as Mars, Jupiter and Saturn rotate above the Earth. The Sun does indeed set. Historically there was a third star in the Sirius cluster, which exploded into two halves. In their new movement patterns, one half (termed Black Sun) causes the solar eclipse, the other (the Shadow Moon) the lunar eclipse. Before this point the Sun and moon both shone with equal intensity and the Earth had 24 hour daylight. Fifty years after this cataclysm was the Great Flood. The asteroid belt was formed when Jupiter collided with the second of these two halves. Both Jupiter and Venus emit bosons. There are two other celestial bodies, one over each pole (the North Pole, the receptive one, located north of Greenland. the South Pole, the emissive one, over Antarctica, which is larger than commonly believed, not covered by ice and inaccessible). These cause the Aurora and give light to their respective poles at certain times of the year, but their orbits never take them far. The body over the North Pole is itself named Aurora. Satellites do orbit, and are powered by a device that triggers laevorotatory subquarks via an electrical current (the Biefield-Brown effect). Aether is a universal medium, a fluid, filling all of space, and through it flows ether, which is ultimately the energy source for everything. It is described by means of an analogy; according to conventional science, atoms feature a kind of perpetual motion, with electrons constantly moving. Ether is the energy source that allows for this motion to happen. Ether will be better defined below. Aether, it has multiple densities, and there are many layers of it between us and the Sun. When light passes through these different densities of aether, it is refracted. Light travels through aether akin to the way sound waves travel through matter. Ether flows through aether into physical objects; this causes a pushing force, gravity. This pushing force could not result in rotational motion however, so the force affecting the Sun, moon and stars is somewhat different. Instead they exist on the other side of a barrier and are subject to rotational gravity from ether. The variation in the pushing force, the telluric currents, is responsible for tides. These are made of closed loops. The direction in which they rotate is also important; those which rotate left are called laevorotatory, while those that rotate right are called dextrorotatory. They could also be called positively and negatively charged. This rotation, along with the shape of the subquark, creates a vortex that could be receptive (for dextrorotatory subquarks/negative charges), drawing in ether, or emissive (for laevorotatory). Neither subquark is exclusively emissive or receptive, just predominantly so. An electrical current is caused by ether flowing along through these vortices, from emissive to receptive; a conductor is a material in which the subquarks are lines up to allow bosons to be transmitted from one to the next. . Magnetic fields are similar, because caused by the 'double helix' of positive and negatively charged/laevorotatory and dextrorotatory vortices affecting the flow of strings of bosons through a subquark. The difference between it an electricity is that electricity is a subquark flow through some conductor, while magnetism is external. Magnetism can be viewed as two streams spinning around each other, one going to the North Pole, the other to the South. This general principle, as would be expected, is the same for handheld magnets and the planet's magnetic field. Of these two streams, only one is studied by modern science, the electromagnetic stream. The other stream that runs counter is the gravitational flow. The Earth's magnetic field is composed of a subquark flow that begins at one pole, goes through the centre of the Earth, and reaches the other. All of space is filled by these torsion fields, these vortices, and they affect one another. The aether is composed of these molecular vortices. All matter is composed of both laevorotatory and dextrorotatory subquarks. For example, a hydrogen atom is composed of eighteen, nine of each spin. This allows for hydrogen to not in fact be the lightest element; in fact, there are two lighter, both unacknowledged by mainstream science The heavier is named Koronium by Dmitri Mendeleev. Koronium is prominent in the Sun's corona, hence its name, and is formed of two quarks (rather than the three of hydrogen), and instead of the negative charge being ascribed to one electron as in the mainstream model, this charge is instead divisible. Further, koronium is already 'imploded,' composed not of whole protons but rather just quarks, and further is completely imploded, not merely partiallly imploded as happens when other elements undergo torsion/electrical fields etc. As such, any gravitational force has no effect on it, as its antigravitational force is active. Lighter still, also named by Mendeleev, is Newtonium, emitted by the Black Sun. This is the lightest element of all, composed only of strings of subquarks. X-rays are emitted by the Sun, not because of high heat, but because of electromagnetic particles being accelerated through its ether field. That is, their source is electrical. Dextrorotatory subquarks absorb aether, laevorotatory subquarks emit it. I cannot wait to read the rest of your study of sandokhan's model. I have tried to read his thread several times, but there are so many links and other stuff that I always give up. "You are standing in a field looking at the stars. Your arms are resting freely at your side, and you see that the distant stars are not moving. Now start spinning. The stars are whirling around you and your arms are pulled away from your body. Why should your arms be pulled away when the stars are whirling? Why should they be dangling freely when the stars don't move?" This was one of Einstein's inspiration for the Theory of Relativity, and basically states an equivalence between rotating reference frames in a similar fashion to the equivalence principle's statement on acceleration. Applied to FET, it is used to explain instances of the Coriolis Effect. The principle states that if you are on a rotating Earth surrounded by stationary stars, that effect would be identical to being on a stationary Earth surrounded by a rotating universe. This is often connected to celestial gravitation and celestial gears. And I think the post has gotten too long as the site crashes whenever I try to edit. A subquark is composed of over fourteen million bosons, and more antibosons. Boson strings travel through the ether as longitudinal waves. These may, for simplicity's sake, be imagined as a bubble that trails a 'tail' of energy. When a boson enters a subquark it shrinks down to just be this energy, which coalesces when it emerges from the subquark to again be a bubble. It is this 'tail' that forms a boson or antiboson. The downwards facing pyramid produces aether, while the upwards facing activates it. Typical bosons produce more ether than aether, but dark bosons, those that form dark matter, produce more aether than ether. If a quark is viewed as subquarks connected by lines, those lines are bosons. There are four stages of ether, each composed of strings of various fundamentals: reflector ether, composed of subquarks of either spin; luminiferous ether, composed of quarks; vital ether, composed of mesons; and finally chemical ether, composed of baryons. Each of these is more complex than the previous, subquarks being the ultimately building blocks of each. The closed loops that make up a subquark are composed of bosons and antibosons, and never touch. Below even subquarks, aether is also a state of ether, the medium that the subquark strings travel with. When an object rotates at a high speed, it implodes slightly; the atoms break down into baryons, the fourth stage of ether. The outer surface of a rotating object will have more of these imploded atoms, attracting what are called Whittaker potential ether waves to it. This creates a vortex around the object, shielding it from the dextrorotatory strings that cause pressure-gravity. Gravity is caused by the pressure exerted by the ether flowing into matter. For the Earth, this takes the form of telluric currents, observed natural electric currents that cover the Earth's surface. At higher altitudes, the pressure of laevorotatory subquarks diminishes as laevorotatory strings have an increased rate of vibration. Thus, pressure is less. Dextrorotatory subquarks are gravitational, laevorotatory antigravitational. If a bottle is sealed at the top of a mountain, say, it is sealed where laevorotatory subquarks are more active. When you bring it down, the emissive vortices of dextrorotatory subquarks within the bottle are stronger, and basically cause it to implode. At high altitudes, there are more laevorotatory, emissive subquarks and so the density of aether (the underlying medium) increases. The highest density of aether is between the first dome and the outer, second dome. The sum of the antigravitational force and the gravitational force always adds up to a constant. Thus, the multiple effects mentioned above are explained. There is a pressure gravity, 'terrestrial gravity' caused by ether flowing into receptive, dextrorotatory subquarks, a force which is dominant closer to the Earth's surface. Dextrorotatory subquarks can, over the long term, decay objects (some elements are more susceptible, are they are what we call radioactive. Radioactivity can be stifled by triggering laevorotatory subquarks). Further, this decomposition effect is what has caused the ice caps to melt; global temperature has not increased, but rather the vibration of dextrorotatory subquarks has increased. Laevorotatory subquarks counter this; in consequence, this explains why the amino acids that make up almost all proteins are what are called L (for laevo) proteins. Pressure is perhaps the most intuitive way of thinking of this, but gravity is better viewed as the rate at which ether is absorbed by the receptive vortices. Then there is rotational gravity, caused by how, on the far side of the first dome, laevorotatory subquarks are just as active. Levorotatory subquarks have an antigravity effect due to emitting ether too. There are ways to bias whether an object will emit or receive; imparting torsion/rotation (DePalma Spinning Ball experiment), high electrical tension (Biefeld-Brown effect), or sound waves can be used to trigger laevorotatory subquarks and cause emission even close to the Earth's surface. On the Whittaker scalar potential waves mentioned earlier, Whittaker was a physicist whose work state that electromagnetic and gravitational fields can be decomposed into two scalar potential functions, and in turn that scalar potentials are composed of a lattice of bidirectional longitudinal waves: these waves are the ether, laevorotatory and dextrorotatory strings of subquarks. This notion of gravity has a connection to time. Following from the work of Russian scientist Nikolai Kozyrev, time is not a passive, dimensionless concept; it has direction, allowing cause and effect to be differentiated. Time enters into things by allowing cause to progress to effect, and the orientation of time alters the subsequent effect. From this, it follows that time has energy, and more specifically can impart or take away energy from a system depending on its direction. Ultimately all effects come from movement, and without movement the concept of time has no meaning. The flow of time through an object affects its weight, and in turn the rate at which time passes can be affected. The rate of flow of time can be considered the distance between cause and effect. 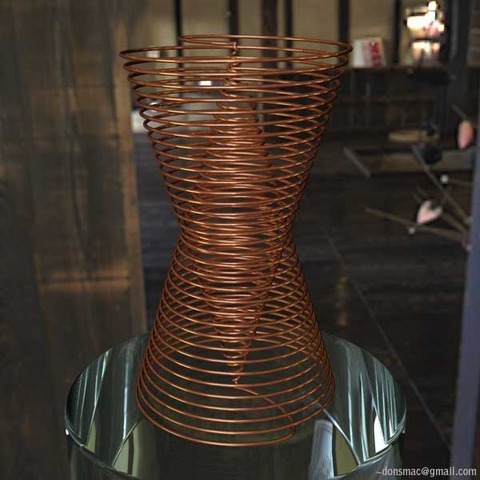 This can be connected to the above by another of Kozyrev's results; in a left-hand rotating system, the time flow is positive; that is, it adds energy. Meanwhile in a right-hand rotating system, the time flow is negative. This forms an immediately parallel with the torsion fields of subquarks. Time is the dextrorotatory flow of subquarks, while its inverse, termed antitime, is the laevorotatory flow. The Black Sun (which is in fact a dark red colour) emits laevorotatory subquarks, the visible, regular Sun emits quarks (luminiferous ether) which it has transformed from laevorotatory subquarks. The Black Sun, being the cause of solar eclipses, is thus used to explain the Allais effect. Further, the laevorotatory subquarks emitted balance the dextrorotatory subquarks that would otherwise cause terrestrial, pushing gravity. The rotation of the stars about two points is analogous to the effect of subquark vortices, which can be in opposite directions as covered above. Recall that, beyond the first dome, rotational gravity is dominant. Well, mostly, skipped Zeta function and historical posts, usually skimming, because they're not too connected to what I include here. Next up, fixing up and clarifying a couple of points, compare with related texts, then write it all up properly. Whew. I'm not including a lot of the revised version of history, the experiments in support of AFET and the experiments against RET in order to streamline and focus on the model. The six gates theory link is broken and all that's on this site is here and here and here, to be unpacked later. Velikovsky was mentioned several times. The Book of Enoch gets a mention, as well as Occult Chemistry, and Nikolai Kozyrev, and the Bundahishn, and Secret World of Magnets. I'm breaking style slightly because this model merits a lead in. There is a lot to it, in his thread 'Advanced Flat Earth Theory' in the Believers board. It contains his model of the Earth, the evidence and experiments that support it, arguments against the mainstream RE model, as well as related points on a revised chronology of history and Riemann's Zeta function. As ever, my compendium is focused on presenting the key points of a model. This is by no means exhaustive, but hopefully it gives you a sense of AFET and makes it easier to get started reading Sandokhan's thread, if you want to. I'm not going to include 'contentious' points, arguments for or against a model, which make up a lot of his thread. I will present the statements of the model and the observations they explain, but if you are intererested in the sources and evidence I suggest you go to that thread. We've a lot to cover and I can only present a fraction. I'll cover the nature of the atom and its properties, followed by the application of this to the Earth at large. Probably my biggest omission is the revised chronology, which does tie to several points. I may go back at a later date and add a timeline to the compendium, but for the meantime the two above are planned. We begin by defining ether as, ultimately, the building block of everything. The most basic stage of ether is called aether, and it is the medium that underlies everything. Light travels through the aether as sound waves do air. It is the energy source for the movements of fundamental particles. There are multiple densities of aether. As with any shift in medium, light is refracted when it travels from one density to another. Next is reflector ether, which is composed of subquarks. It is fundamental to almost all of what follows. Each subquark is composed of ten closed loops that never touch, and these loops are formed from bosons and antibosons. Every subquark spins and, due to the heart-shape, this forms a vortex around it, drawing both aether and ether towards the top and out of the point at the bottom. A subquark may spin to the right, meaning it is dextrorotatory, or left, meaning it is laevorotatory. While every subquark both receives and emits due to its vortex, one of those two behaviours is dominant. As such, dextrorotatory subquarks are said to have receptive vortices, and laevorotatory subquarks are said to have emissive. (This could also be thought of as a negative or a positive charge, respectively). Luminiferous ether, composed of quarks, which are composed of subquarks connected by bosons. Vital ether is next, formed of mesons (a quark and an antiquark). Finally we have chemical ether, composed of baryons (three quarks). Strings of subquarks compose the ether. Before moving onto the properties, we look at bosons; over fourteen million of these compose a subquark, alongside their antiboson counterparts. Boson strings travel through the ether as waves. The downwards facing pyramid produces aether, while the upwards facing ‘activates’ it. Typical bosons produce more ether than aether, while the opposite is true for ‘dark’ bosons, the bosoms that compose dark matter. So far, we have a different basis for atomic physics. Space is filled with the aether, a medium in turn filled with molecular vortices that jostle against each other, from the ether strings that fill it. Every object is formed of both dextrorotatory and laevorotatory subquarks, however they will not always be equally active. Laevorotatory subquarks may be activated with certain types of sound waves (Tibetan acoustic levitation), electrical fields (the Biefeld-Brown effect), or by imparting torsion/rotation (Bruce DePalma’s spinning ball drop experiment). Thus, an object where dextrorotatory subquarks are dominant will find that there is a pressure exerted upon it, caused by each of the subquarks that make it up; dextrorotatory subquarks are said to be gravitational. Laevorotatory subquarks, by contrast, are antigravitational. Objects where both subquarks are active will not be subject to the aforementioned gravitational force, and will instead be governed only by ‘rotational gravity’ imparted by the vortices. Dextrorotatory subquarks, over the long term, may cause an object to decay. This is also responsible for radioactivity; the radioactivity of objects may be stifled by triggering the laevorotatory subquarks that also compose it. When an object is rotated at high speed, the atoms composing it break down into baryons, the fourth stage of ether. The term used for this process is ‘implosion.’ When this happens, a vortex is formed around an object, shaped like two overlapping cones, the apexes of each having passed into the other’s. This torsion field shields an object from ether strings. A consequence of this alternative model of the atom is that it allows for hydrogen to not be the lightest element. Hydrogen is, here, composed of eighteen subquarks: nine dextrorotatory, and nine laevorotatory. (Mainstream physics agrees that the proton may be split up into quarks and subquarks, but ascribes the negative charge entirely to one indivisible electron rather than nine subquarks). Two lighter elements, both named by Mendeleev on his original periodic table, are Koronium and Newtonium. Koronium is formed of two, rather than three like hydrogen, quarks, and it is completely ‘imploded’ as it is formed entirely of quarks rather than a whole proton. As such, it is not subject to any gravitational force. Newtonium is the lightest element of all, and in fact is just the subquark strings already referred to. Information on what differentiates known elements has only been outlined, the book Occult Chemistry mentioned in the foreword covers it in much more detail. Now, when an object is said to be an electrical conductor, this means that the subquarks that composed it are lines up such that the emissive tip is pointed at the receptive top of the heart-shaped structure. Thus, bosons may be transmitted through it, from one subquark to the next. As one would expect, magnetic forces are similar, caused by the ‘double helix’ of vortices, already mentioned to be likened to positive and negative charges. Electricity is the subquark flow through a conductor, while magnetism is external. In fact, electromagnetism and gravity are components of the same force. The magnetic field of any object, from a fridge magnet to a world, an be viewed as two streams spiralling around each other, one heading to the North Pole, one heading to the South. One of these streams is the electromagnetic force, studied by mainstream science, while the other is the gravitational flow. This section will draw heavily from the vortex model of the atom. If a term is used but not defined, it is likely typical scientific terminology. The Earth is an entirely stationary flat disc, a little under 40,000km in circumference, and the Centre is the Sea of Marmara in Turkey, the location of Eden. Antarctica is an island. Around the known Earth is a ring of land that is populated by animals and plants, a continent called Antichtone. Beyond this ring is a vast sea of water, known of in ancient times, that is the source of underground rivers and the like. The Earth is contained within two domes. The first is composed of a very dense layer of aether and ether, and beyond it is where the Sun, moon, stars and planets all reside; they never pass within the first dome. Past them is the second dome, which marks the border of what can be considered the universe. We stay on the Earth’s surface because of the pressure exerted by dextrorotatory subquarks (gravity is best viewed as the rate at which ether is absorbed by the receptive vortices), which are also the telluric currents. If, for example, you were to seal a bottle at the top of a mountain, it would be sealed where laevorotatory subquarks were more active; when the bottle is brought down the mountain, the vortices of dextrorotatory subquarks become stronger and essentially cause the bottle to implode. The variation in this downwards force is responsible for tides. The vibration of dextrorotatory subquarks has increased, and the decay effect caused by this is causing the ice caps to melt. Laevorotatory subquarks counter this decomposition; this is why the proteins that make up matter are L-proteins (L for laevo). There is more aether at higher altitudes due to the increased presence of laevorotatory, emissive subquarks. As such, the path of light is curved when it moves through the medium’s altering density. The Earth’s magnetic field is composed of a subquark flow that begins at one pole, passes through the centre of the Earth, and then goes into the other. The North Pole is receptive, the South emissive. The Sun, moon and all stars are flat discs. The Sun, moon and (for scale) Jupiter have a diameter of 618m. The Sun is 10km up. Historically there was a third star in the Sirius cluster that exploded into two halves; these halves are now called the Black Sun and the Shadow Moon, and are distinct from the regular Sun and moon. The former causes solar eclipses, the latter causes lunar eclipses. Before this happened, the Sun and moon shone with equal intensity and there was 24 hour daylight. The asteroid belt was formed when Jupiter collided with the second of those two halves. The moon, Mercury and Venus rotate around the Sun. The Sun, Mars, Jupiter and Saturn rotate above the Earth. There are two more celestial bodies of note. One is named Aurora and orbits over and near the North Pole, never moving far, and as its name suggests the light is gives is the aurora. It has a counterpart over the South Pole that does much the same. The Sun’s path is composed of arches. It rises beyond Japan, illuminating half the Earth’s surface, and sets past Antarctica where it then rises to complete its orbit over the other semicircle of the Earth’s surface. The Sun does indeed set, rather than dwindling out of view. The Sun emits high frequency electric energy into the low pressure gas in the upper atmosphere, causing the luminescence that is observed at Sunrise. Thus, a setting Sun swiftly becomes a rising one. These electric currents also affect the Earth, indeed they are the Birkeland currents associated with the Earth’s magnetic field. (There are also Birkeland currents throughout space). The electromagnetic particles it emits, due to being accelerated through the ether field, become X-rays. The Sun emits quarks, or luminiferous ether, which it has transformed from laevorotatory subquarks. The Sun also gives the energy required for the moon to be illuminated, though this energy wanes, causing phases. The Black Sun (which is in fact a dark red colour) emits laevorotatory subquarks, or Newtonium. These are responsible for the Allais effect during solar eclipses. Further, due to their presence above the first dome, there is no ‘pressure gravity’ (or ‘terrestrial gravity’) force, and so the celestial objects will not fall. Jupiter and Venus emit bosons. Satellites exist, but are kept aloft by an application of the Biefeld-Brown effect; triggering laevorotatory subquarks via an electrical current. The Sun, along with the moon and stars, travel through six gates on the outside of the first dome. These gates mark down the distance between the tropics. There are six gates in the east, and six in the west; the Sun spends approximately thirty days in each. They map out the distance from Summer to Winter solstice, and from Winter to Summer solstice. Each day the Sun rises through one gate, and sets by passing through its counterpart on the other side. There are thirty windows associated with each gate. Each gate is 1048km in arc length, and so each window is approximately 35.4km. The axial precession of the Sun is a gauge of what part of a window it travels through. When the Sun reaches the final part of a window, all celestial objects will be as they were originally; at this point it will be possible to see the moon as a separate entity during solar eclipses. For the source of this, check the referenced chapters in the Book of Enoch. The stars appear to rotate around two distinct points as a larger scale analogue to the subquark vortices that rotate in opposing directions. There are a number of FE models which fundamentally change some underlying physics. In these cases it's impossible to explain anything of significance in the model without first going over those underlying principles. As such, for ease of linking, I'm referencing all the constituent parts of denpressure in this post. There are a number of FE models which fundamentally change some underlying physics. In these cases it's impossible to explain anything of significance in the model without first going over those underlying principles. As such, for ease of linking, I'm referencing all the constituent parts of DET in this post. There are a number of FE models which fundamentally change some underlying physics. In these cases it's impossible to explain anything of significance in the model without first going over those underlying principles. As such, for ease of linking, I'm referencing all the constituent parts of AFET in this post. First of all there is a summary. As AFET is easily once of the most, well, advanced models a great deal was omitted from my overview. This model is used as an explanation of how the Sun and moon stay aloft. It is used in some UA and/or dome models. In the distant past, the Sun and moon were huge discs of metal on the Earth's surface. The core of the Earth, below the Earth's crust, is a molten metal core. It is well established that certain frequencies of ionising radiation can affect matter, knocking electrons out of the atomic structure and as a result giving the matter a charge. It is said that this radiation affected both the discs and the metal core (one source of this radiation is said to be the source of the universal acceleration in UA models) and gave them like charges; as a result, they are repelled from one another, and so the Sun and moon are kept aloft in the sky because they cannot fall down to the Earth and come closer to its charged core. The level of this electromagnetic radiation fluctuates, weakening or strengthening the repulsive force and allowing the Sun and moon to move and cycle around. This is not connected to the source of their light. This phenomenon is predominantly relied upon in the Infinite Earth model. It is used to explain how the stars, Sun and other such celestial objects remain over the Earth's surface despite the pull of gravity. The basic principle is simple: space itself is said to expand at a rate greater than the acceleration caused by gravity. Thus things over the Earth are falling, but the distance they have to fall is increasing so they never appear to get closer. This would also result in redshift. I, for one, am enjoying this compendium. This is a little outside the usual wheelhouse for this thread, as it's not exactly a principle specific to FE models and this isn't intended to answer every question asked of FET, but there are a few interesting concepts used so it seemed worth a mention. First, as ever this is not universal. There are FE models (like the non-Euclidean) that allow for conventional space travel. Beyond that however, what fills the roles of satellites if there is no space travel? This question can especially be asked when there is no clear means for a perpetual orbit. The catch-all term here is stratellites, which are literally just in-atmosphere equivalents. Commonly these are posited to be anything from planes, airships, balloons... though there are models (such as AFET) that have an alternate explanation for gravity that can be cancelled in certain circumstances allowing for machines that we have no real existing name for that can stay aloft easily. More conventionally, there can also be communication towers with either a direct line of sight, or a signal bounced off the upper atmosphere. This allows for signals to be transmitted. These can also be used to simulate points higher up. A satellite dish pointed one way could receive a signal from anything along that line, no matter how far it is. Two dishes claimed to be pointed to the same satellite are not necessarily doing so. This kind of simulation is connected to the GPS question; at a basic level GPS functions by a receiver picking up a signal from a transmitter containing the time at which the signal was sent, which is then used to determine how far away the transmitter is. With multiple transmitters, this ends up providing enough information to find a location as there will only be one spot that is the known distance away from the various points. If a stratellite staggers the signals it emits, it can give the mathematical equivalent of a signal sent from higher up, at least if the signals are more directional. For an example, forgoing units so we don't have to be constrained to realism, in the RE model a person on the ground might have a GPS transmitter telling them that they are 10 away from satellite A, and 12 away from satellite B. In the FE model, stratellite A would be 5 away from the person in question. To compensate, the signal it emits is delayed; it gives the signal it itself would receive if there was a satellite A 5 away from it. Thus it creates the illusion of a satellite at higher altitude. A transmitter would still receive the 10, but this is just because the stratellite is giving data staggered as though it had already gone a distance of 5, only for it to go another 5. The same holds for stratellite B. With this principle, GPS essentially functions as a landmark system. If you are a known distance away from a known point, it naturally gives an accurate reading of where you are. This is true independently of whatever world map is programmed into the receivers; any error that would creep into a journey based on differences between a flat and round map would, on the comparatively small scales of normal journeys, be put down to typical error just from the process of travelling and immediately be corrected for by locating another known point of a stratellite.